What comes to mind when you think of tiki style? Do you think of grass skirts and umbrella drinks? Me too ~ but not all the time. Tiki style can also bring to mind elegant tropical resorts. 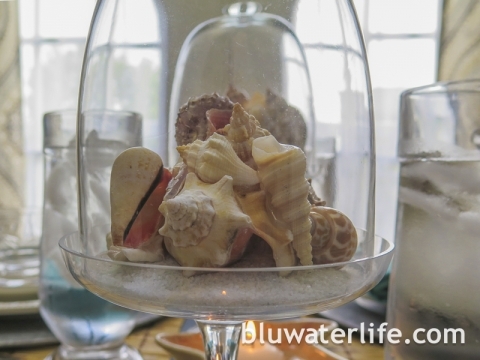 I was remembering a wonderful dinner at a beautiful eco-resort on St.Thomas from a few years ago, and wanted to recreate that feeling for a summer table at home. 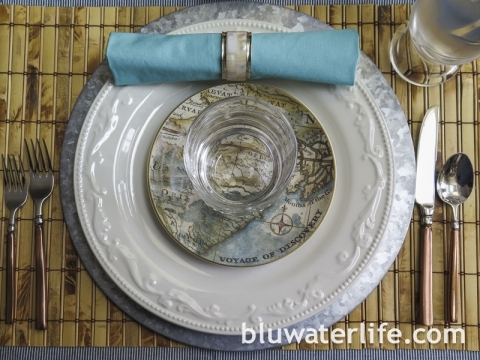 I left the basics in place from my July 4th holiday table ~ table cloth, bamboo runners, metal chargers, cream dinner plates ~ and switched up the rest of the table setting for a tiki style resort dinner. 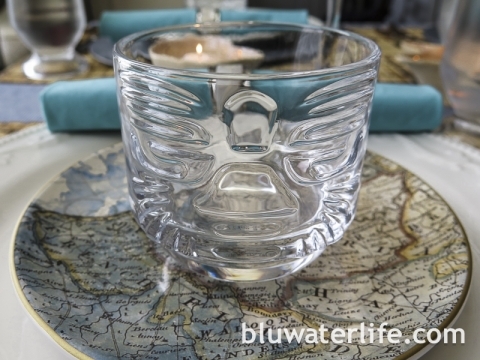 Do you love these tiki glasses from CB2? I wanted them last year, but resisted until I could resist no more and they came home with me this year. The short ones are perfect for appetizers ~ shrimp cocktail, small tropical salad or fruit ~ and of course a tiki cocktail. Mai Tais before dinner anyone? The larger glasses remind me of the Easter Island Moai statues. I love how they reflect the light from the floating candles in the center of the table! 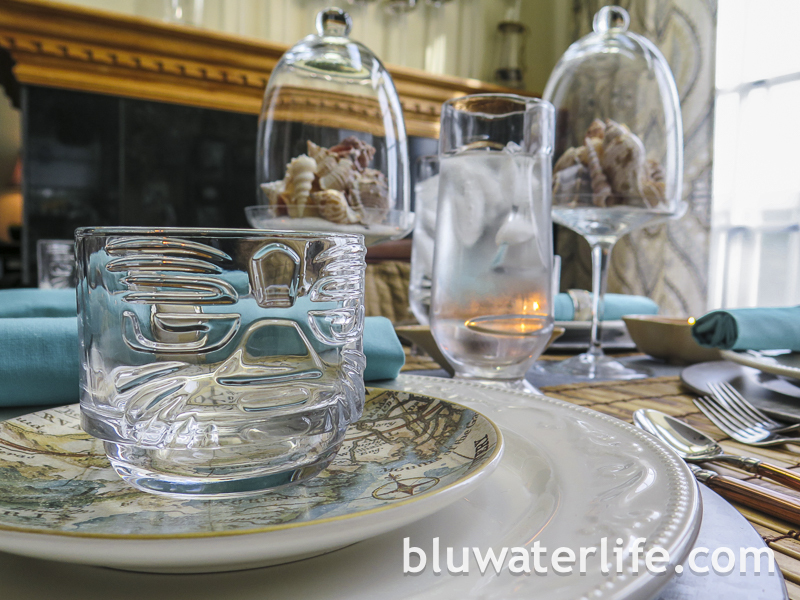 I pulled the glass cloche shell displays straight off the dining area shelves and put them on the table for decor. 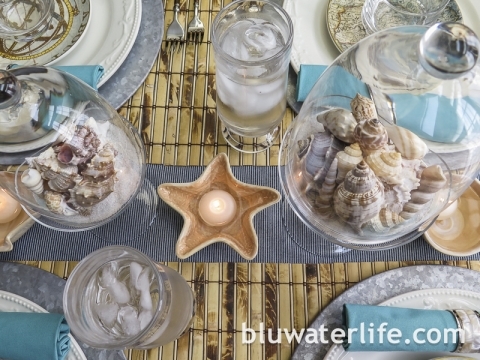 Floating candles in small ceramic shell dishes complete the shells, sand, water and fire combination. The glass cloche/pedestals are from Sur laTable and I’ve had them for years. I realized after setting this table, that I’ve shared a different look each season this year. Fall, Christmas, Spring and now Summer. 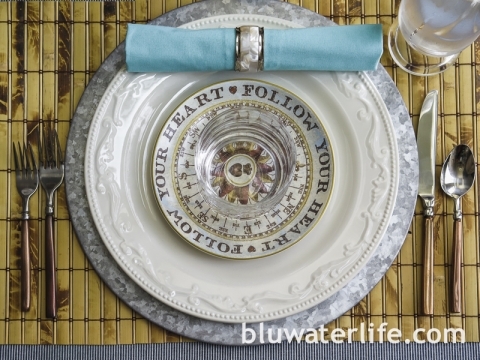 There have been some holiday set-ups too ~ Valentine’s and July 4th each had a moment. You can tell my dining area doesn’t change much, but I do like to change up the table decor. Sometimes for a special dinner, or sometimes just for whatever is going on that week. Hey, if you’ve got it, use it! 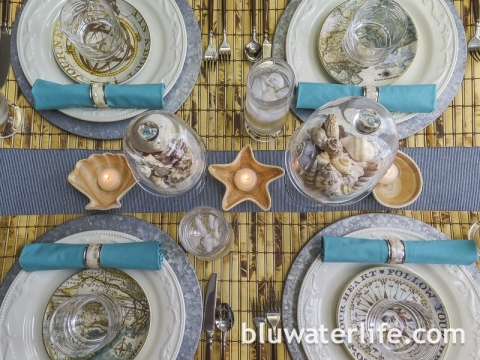 Your tiki ware and tablescape remind us of our Hawaiian vacation. 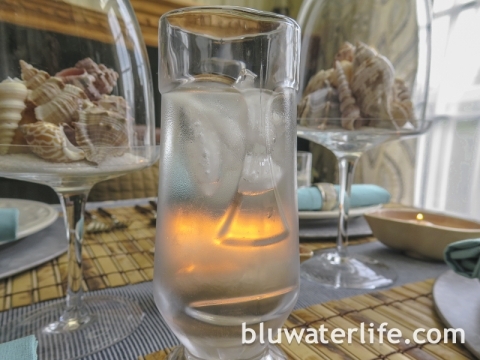 The glassware is so festive and your color choice and table setting are beautiful.